Five pools; two tennis courts; fitness center; salon and day spa; and a choice of three dining venues. and Grayhawk Golf Clubs; Stadium Course at TPC Scottsdale; Scottsdale Museum of Contemporary Art; Scottsdale Center for the Performing Arts; Musical Instrument Museum; Scottsdale Historical Museum; Main Street Arts District; Taliesin West; and Desert Botanical Garden. Four of more than two dozen golf courses in Scottsdale, Arizona, surround The Scottsdale Plaza Resort. Set against the city’s signature backdrop of Camelback Mountain, the lushly landscaped, 40-acre property exemplifies the Arizona lifestyle. Guests settle into 224 spacious and newly renovated standard guest rooms; 170 newly renovated King, Villa, Patio, and Bi-Level Suites; and 10 secluded Executive Lodge Suites. The resort combines modern elements and Old World charm, along with comforts such as fireplaces, private patios, and four-diamond amenities and personalized service. Meanwhile, the property’s 30,000-square-foot conference center treats meeting planners to a choice of 24 venues for 10 to 1,000 people. Popular options include the intimate La Vinca boardroom, the El Teatro tiered amphitheater, the 1,860-square-foot Las Palmas and 2,820-square-foot La Valencia rooms, and the 10,080-square-foot Grande Ballroom. Cypress Court, Plaza Lawn, and patios at Garden Court and JD’s Restaurant & Lounge provide an additional 20,000 square feet for events under the sun and stars. Behind the scenes, a dedicated conference services team sees to everything from destination management and catering to audiovisual needs and offsite excursions. During free time, guests can visit three dining venues: JD’s, Garden Court, and the poolside Café Cabana. Other amenities include five pools, two lighted tennis courts, a fitness center, and a salon and day spa. Just moments from the restaurants, shops, and galleries of Old Town, it’s little wonder that at The Scottsdale Plaza Resort, successful meetings and vacations are often one and the same. I have been on a site visit to this property, and intend to hold a future Leadership Meeting (85+ associates) at this property. The sales team, along with the president, Mike Teed, is always striving to earn our business. I truly believe they would do an outstanding job of helping me execute a perfect meeting for my group, and I am hopeful to give them that opportunity soon. They have a beautiful ampitheater which would suit a group of approximately 80 perfectly. Visited on a FAM Visit. It was a great opportunity. Staff was friendly and very accommodating. All events held on the property were great. The property is spread out, with lots of walking or use of the golf carts to get to the meeting space. This just was not feasible for our group. rooms are nice, but a bit outdated. would love to see soft goods renovation. great amenities, pools, recreation, location, etc. SCOTTSDALE, Arizona, October 2017 – The Scottsdale Plaza Resort announces conclusion of our three year property improvement plan. Expanding the Closet Area / Vanity Bathroom area with more square footage, new accent chairs for seating area and desk by Living Spaces. New framed vanity lighted mirrors by Electric Mirrors, Granite on Wet Bars and Vanities by Arizona Tile and the addition of in-room refrigerators. 2016 we conducted upgrades to the Suite Category of rooms which included-new bed frames and matching dressers, all new furniture, artwork and lighting in the living room areas, new in-room charging stations and many of the upgrades that were featured in the standard rooms—like mounted wall televisions, new plumbing fixtures and granite on the wet bars and vanities. In 2017 we embarked on upgrading all of our common areas-Ball Rooms, Front Desk, Lobby, Meeting Spaces , Rest Rooms and Gift Shop. This includes all new furniture, lighting, flooring and wall covering. We will unveil our new public spaces at an Open House on November 2nd for meeting and events professionals with guided property tours, cocktails and culinary demonstrations and drawings for Room stays. 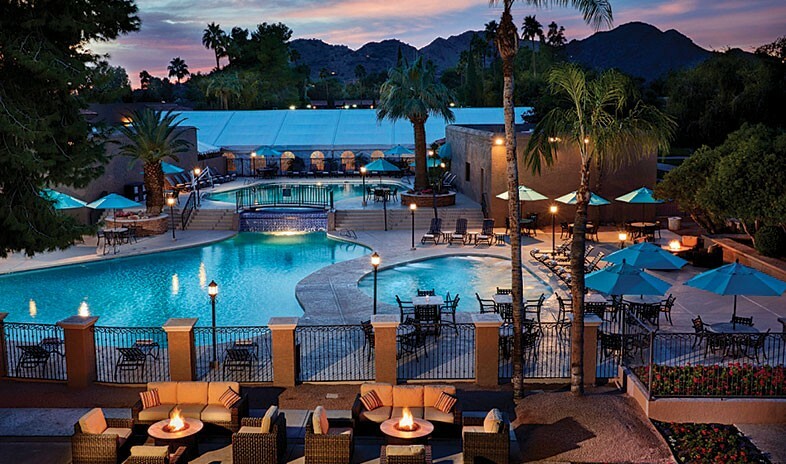 Situated on 40 lush acres of magnificently landscaped grounds and with over 40,000 square feet of flexible and functional meeting space, the Scottsdale Plaza Resort offers the perfect retreat for business travelers, conventions and special events. With five pools, a full-service spa, on-site tennis courts and championship golf just steps away, the Scottsdale Plaza Resort is the perfect getaway for the family or business group. For more information visit www.scottsdaleplaza.com. Scottsdale, AZ – The ‘landmark’ Scottsdale Plaza Resort, located in the heart of Scottsdale and Paradise Valley, announces the continuation of room renovations. The Plaza completed a plethora of improvements in 2012, 2013 and 2014 and now releases the details regarding the additional room renovations projected in summer 2015. The renovations begin in May, 2015 with the first phase to be completed mid July and the remaining standard rooms to be finished in October. “We listen to our guests who want the best in accommodations but at an affordable price” said David Lunt, President at the Scottsdale Plaza Resort. “It’s important to elevate the guest experience with so many accommodation choices in the Valley- we believe our upgrades in this category of rooms will make a notable difference in their comfort” he added. The Scottsdale Plaza Resort is offering a summer promotion encouraging guests to experience the improvements themselves with the “Summerscape” package. The special offer includes room rates starting as low as $129 per night and a $100 credit to be used for spa, food or beverage. Valid May 29th- September 1st. The Scottsdale Plaza Resort boasts numerous amenities to enjoy the sun drenched-days and hot summer nights, including; five sparkling pools, lighted tennis courts, a fully equipped fitness center, a full-service salon and day spa, and a nine-hole putting green. Resort guests and visitors have several dining options at The Plaza, from a light lunch by the pool at Café Cabana, or a breakfast brunch at Garden Court, to a romantic dinner at Remington’s, or cold beer and freshly popped popcorn while watching your favorite game at JD’s Lounge.